The river winds its way around the outcrop through a deeply wooded gorge. 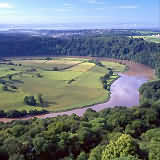 Yat Rock is one of the best known view points in the Wye Valley and The Royal Forest of Dean. Symonds Yat West is on the Herefordshire side of the river and Symonds Yat East is on the Gloucestershire side. The only connection between the two banks are two ancient hand ("pull") ferries by which the ferryman pulls people across the river using an overhead rope, for a small fee. The only connection by road is upstream over Huntsham bridge; this is a five mile trip. Symonds Yat Rock is a scenic viewpoint towering 120 metres above the river on the Gloucestershire side. From this viewpoint it is possible, between April and August, to witness a pair of Peregrine Falcons nesting on the cliff side. Volunteers from the RSPB help visitors to use telescopes provided in a joint project with Forest Enterprise, owners of the site. Popular tourist activities in the area include canoeing down the rapids, boat trips, a maze, an oriental garden and many country pubs. 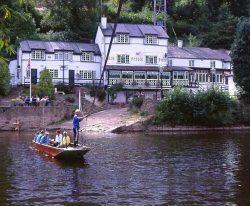 The Old Court Hotel in Symonds Yat West was the ancestral home of the Gwillim family and was home to John Graves Simcoe who was governor and one of the founding fathers of Upper Canada. A favourite pastime for many of the local children is to swim across the river to a small rock on the other side from the renowned hotel, although attempting this in early May while the Spring tides are at their maximum is not advised. Wild Peregrines have long been associated with Symonds Yat Rock. They had bred well here until the early 1950's when the effects of pesticides drastically reduced the national population. In 1982 the re-occupation of the site started when three young were reared but the following year the nest was robbed. 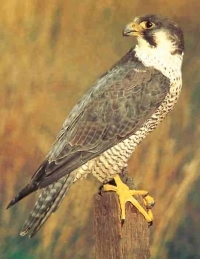 After this event in 1984 the Royal Society for the Protection of Birds, in co-operation with the Forestry Commission made a protection scheme and for the first time Peregrine Falcons in the wild were shown to tourists. Since then the Rock has had many visitors to see the Falcons and volunteers have helped to safeguard these impressive birds. During the breeding season the RSPB make powerful telescopes available to visitors, so that you can see right into the nests!